It's funny at our house it's sometimes a split household where it's boys vs girls. The boys think they have us out numbered but in less than two months our precious little girl will be here to even out the playing field. What a beautiful family you have. You look amazing!Congratulations! Those are the sweetest pictures. You look GREAT! So excited for your growing family! So cute! My daughter is into spliting up our household too.. she always makes my son go with daddy so she can go with mommy. lol. I can relate, only the only other girl with me is the DOG! Me, the dog VS the other 4 boys... heaven help us. You're family is darling! So is the belly! I love a good ol' fashioned preggo belly. Um, not in a creepy stalker way though. Promise. :) And, I promise not to run up to you in public and touch it. Swear! you are all so adorable!! You have a beautiful family!!! Hope you are feeling well! You looks fabulous! your family is so perfect, I love reading your story! Happy Mother's day to ya and congrats on you new little one. Your kiddos are too cute!!! Love the matching stripped shirts. Those boys better watch out :) Adorable pictures! Hi Heidi- My name is Sharon. 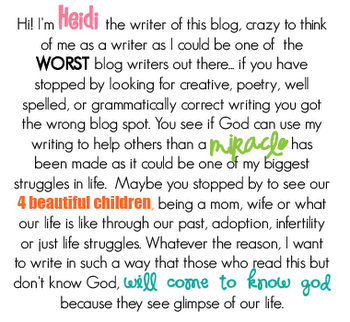 I got to your blog through IAG's list of adoptive families. We currently live in Southeast Asia, but are from Florida and are considering adopting in the coming months. I am due with our 3rd in October, so we're not in any rush! I just wanted to say hi and internet-introduce myself:) I may have questions for you in the coming months!! Your family is beautiful and congrats on your newest one coming soon! If you'd like to check out our blogs please feel free... and if you'd like to link our adoption blog to your own, please feel free to do that as well. Blessings and happy Mother's Day! Hi! What a beautiful family!! Congrats on your soon to be addition! I found your blog today linked from a fellow twin mom friend who recently adopted a little boy. I can't stop reading your beautiful stories and feel like I was lead to you in some way. 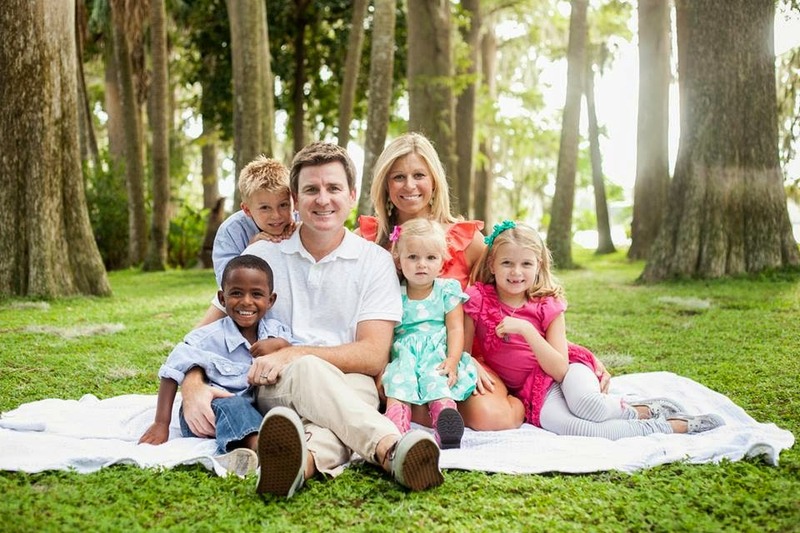 My husband and I have always dreamed of adopting and think it is great all that you are doing. I would love some more information on sponsoring a child that is in need. I saw you have Issac Hunter's blog listed and wondered if by a chance you may go to Summit Church? Thank you for sharing your stories and being so open and honest. Bless you and your beautiful family.